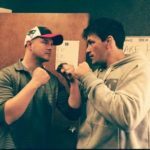 Jared Gooden discusses his upcoming co-main event welterweight showdown with Steven Newell at LFA 59. The event will take place on Friday night at Comerica Theatre in Phoenix, Arizona and will air on AXS TV. “Nite Train” discusses how active he has been in his career, the opponent switch from Kyle Stewart — who got the call up to the UFC recently — to Newell, how he plans to be the most talked about fighter on the card despite no longer being in the main event, what his go-to post weigh-in meal is, pestering Sean Shelby, the Royal Rumble and much more. Gooden also opens up about being in a “dark place” prior to the booking of the fight and how he plans on a “vicious and brutal comeback” this Friday night.